NFL Veterans Doug Brien (Who is Doug?) and Tommy Barnhardt (Who is Tommy?) help get you started with kicking and punting tips, from the beginner to advanced. To expand upon your personal webpage, we have developed numerous ways to improve your kicking and punting. Punting expert Tommy Barnhardt and Kicking expert Doug Brien have put together an entire workout program that will optimize your training, along with specific kicking and punting drills, a lifting program, diet recommendations and stretching routines. Just follow along, and you'll know you're on the right track with how the pros train. Premium memberships also give you access to video training clips from Doug and Tommy, Recipes for Success from other pro kickers and punters, guest articles from other kicking and punting experts, charting program to measure your performance in practice, and much more! Most of our approved Kicking/Punting Camps get calls from coaches asking about their top performers every year. If you do not attend a camp, it is unlikely you will be noticed or recommended. By attending a camp and competing against the best in your area, you can determine exactly how good you are, or where you need to improve. The competitions at camps are great mental preparation for game situations. Many of the online profiles and official stats that get sent to coaches can often seem "too good to be true". 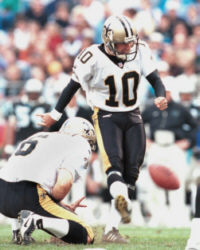 If you get your stats validated using our forms, from an approved camp, you have stronger support for your abilities, as someone who is unbiased has signed their name stating that you can indeed kick a 50-yard FG in practice with no wind, or hit a punt with 5-seconds of hang time. These results will be posted on your webpage for the coaches to view. Doug Brien and Tommy Barnhardt get asked all the time to recommend the top kickers and punters they know. Since they cannot attend many camps or provide private lessons to everyone, the next best thing is to send your highlight tape to them for their expert review. Tommy and Doug will analyze your technique and give you honest assessments of your strengths and weaknesses, and post these on your webpage for coaches to view. You will receive a signed copy of the form, so you have some areas to improve upon. We will also make suggestions on what needs to be included on your highlight tape to get college and professional coaches attention, based on feedback we have received from them over the years. Doug and Tommy will then be able to talk honestly with coaches about your skills and your chances of being successful at the next level. Doug Brien and Tommy Barnhardt have developed many of the items in the store, as a way to greatly improve their own skills, which allowed them to last more than a decade each in the NFL. Look through our products to figure out how to increase leg strength, accuracy and flexibility (to name a few). As you mature in your skills, the physical differences between you and your competition become less obvious. The difference is the mental approach to the game. If you do not currently practice the mental side of the game, you are putting yourself at a distinct disadvantage! Read some of the recommended books from Doug Brien, which will give you an advantage over your competition! 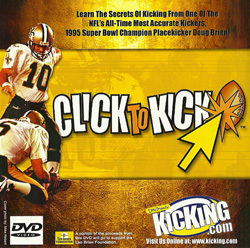 * Evaluate your kicking/punting and make the necessary technical changes. They don't want to change anyone's style. They will simply make sure that your fundamentals are solid and make suggestions that you can incorporate into your style. * Work on specific drills that will help you improve your weaknesses. * Teach you a number of drills that you should incorporate into your normal training routine. * We will go over mental drills and techniques (you will get a complimentary copy of Doug's CD, Click to Kick, or Tommy's Punt-N-It as a reference). 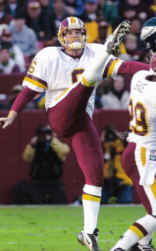 "When I was in college, I flew down to San Diego to have a private lesson with Gary Zauner (now NFL special teams coach). I did this after my sophomore year in college. I went from kicking 71% to 89% in my junior year and 86% in my senior year. Although it was expensive to fly to Gary for a private lesson, it was the best investment my dad ever made, I learned more during those lessons than any camp could teach me. The time I spent with him helped me to take my performance to the next level. In fact, I got so much out of the lessons I went down a total of four times - once after every season so I could have some new things to work on for the upcoming off-season. Gary even helped me by talking to NFL teams. His recommendation ultimately helped me become drafted by the 49ers in the third round. This is why I am offering the same service that helped me so much. I personally would much rather spend time coaching highly motivated kickers one-on-one or in small groups than holding a camp and coaching twenty kids at the same time." Upon completion of the private lesson, add us as your "Expert" on your webpage, and our comments will get high exposure on the search results and high credibility from the coaches when they are searching the database. Contact Doug or Tommy for more information on pricing and locations. Private lessons can be fairly expensive. If you are highly motivated and have potential to play in college or the pros, these lessons can be the best investment you ever make. So, in that sense they are cheap. However, if the lessons are too expensive, I have an alternative: small-group lessons. I will give a one-day lesson to a group of five kickers with similar skill levels. We will spend time on all of the things I would do in a private lesson except you are sharing the lesson with a few other kickers. In a way this format can work out even better because you can learn from and compete with the other kickers. The small-group lessons will be held in the San Francisco Bay Area. I hope to host both kickers from the Bay Area as well as kickers from out of town. Southwest Airlines usually has very reasonable rates to Oakland, CA. Kickers from out of town can catch a commuter flight and stay at a hotel near the airport. I can pick you up the morning of the lesson and take you back when we are done. Furthermore, I will hold sessions for high school kickers at UC-Berkeley. In the afternoon I will hold a kicking contest and either the special teams coach and/or recruiting personnel will come out to evaluate the kickers in my session. These sessions will be used as a recruiting tool for Cal. (As a Cal alumni, I want Cal to be stocked with great kickers). If you are interested in small-group lessons, let me know what month you would like to come out and what your skill level is. Ask them anything related to kicking or punting to learn from their experiences. These guys have been through it all, and they can help provide you with valuable advice.